In this new program, the six members of the Hexagon Ensemble pay homage to two near-forgotten composers and combine their works with that of the well-known master composer Johannes Brahms. 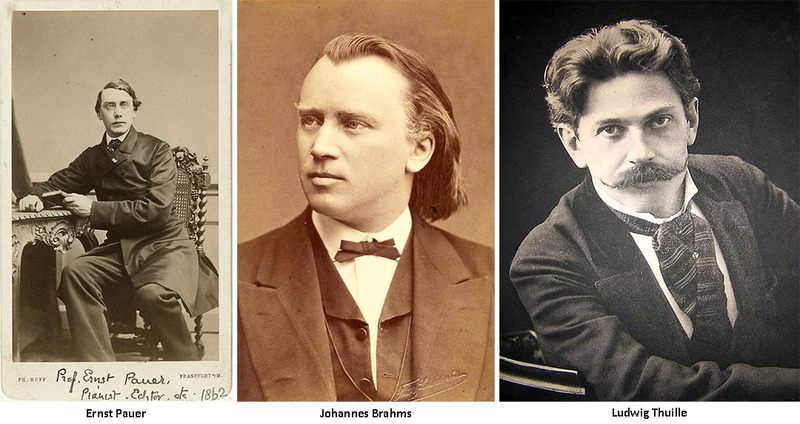 Many composers such as Brahms seem to have written music for eternity. Others, in contrast, have come to be forgotten over the years. They have disappeared into the mist of the past. This is not always justified, however, because many of these composers were hugely popular within their own times. And, once looking at their dusted-off manuscripts, we realize that their music deserves to be heard today as well. Over ten years ago, the Hexagon Ensemble discovered the music of Ernst Pauer. Born in 1826 in Vienna, he became particularly popular in London. Because he had had a formative education as a pianist (studying with no one less than Franz Xaver Mozart, the son of the ‘great’ Mozart), a career as pianist seemed obvious. From 1861 onwards, Pauer gave cycli of concerts in London, in which he gave overviews of the history of music written for the piano, while also publishing books on the piano himself. In the imposing Crystal Palace (built for the 1851 Great Exhibition), Pauer performed numerous times not only works for others but also pieces written by himself. Would he have joined there the performance of his 1856 Quintet in F major, the work which the Hexagon Ensemble has included in this program. Pauer must have been a very virtuosic pianist, because the piano score in this particular Quintet is challenging and recalls memories of Beethoven and Hummel. With this soloistic but also connective piano score, which beautifully mingles with that of the wind instruments, we can rightly speak of a forgotten ‘gem’. His Quintet opus 44 was recorded on the Hexagon cd The British Connection. And then we have Ludwig Thuille who, like Pauer, was an Austrian composer. But was born thirty-five years later. Perhaps the former was more famous than the latter, but still…He was a footnote in the biography of his childhood friend Richard Strauss, whom he already befriended in the 1870s. Within his own time, Thuille was a well-appreciated composer. He received his first musical education from his father but, considering his considerable talent, he quickly ended up with Joseph Rheinberger as a teacher, after which he became in Munich one of the founders of the neue Münchner Schule. Composers such as Ernest Bloch and Walter Braunfels were among Thuille’s students. Thuille died rather unexpectedly in 1907. He had, by then, however written an influential book about the theory of harmony with Rudolf Louis, which would be used until long after his death. The musical development in his body of work – from traditional to a more free form – is clearly audible in his 1889 Sextet opus 6 in B flat major. Thuille wrote to his friend Richard Strauss about the origins of the work as well as how he wrestled with its advancement. When his opus 6 was finally ready, Strauss took care of the premiere, while Thuille played the piano score. The audience reacted enthusiastically, which was not in the least due to the energetic and optimistic character of the music. The absolutely brilliant finale must have given the composer a sense that with this Sextet he had clearly paved a new path for his music. This is, by the way, also a work that the Hexagon Ensemble has recorded on the cd The German Connection. With the giant Johannes Brahms, we have arrived at his masterly Variations on a theme by Joseph Haydn. In this work we hear Brahms’ great appreciation of the variation-form. In his symphonies and chamber music, this composer, born in 1833, was the most prominent successor of Beethoven. The aforementioned Variations on the famous “Chorale Sint Antoni” Opus 56a, however, was originally not a piece of chamber music, but an orchestral work – although Brahms did also write a version of it for two pianos. Notably, after much thorough research, it emerged later that the theme on which it is based was not actually by Haydn. For a long time, then, it was attributed to Ignaz Pleyel – which turned out to be incorrect too. However it may be: Brahms has, with this Opus 56a, written beautifully for wind instruments. Because of this, the arrangement for the Hexagon Ensemble is almost an orchestral experience. This arrangement is written by David Walter.